When it comes to pets, our furry friends are often as just as important (and some days more important!) as the humans that surround us. They offer us comfort when we are sad, joy when we are happy, bring exercise, unconditional love and security as a human companion. That is why this year when you are gifting to all your favorite people, do not forget to treat your pups! 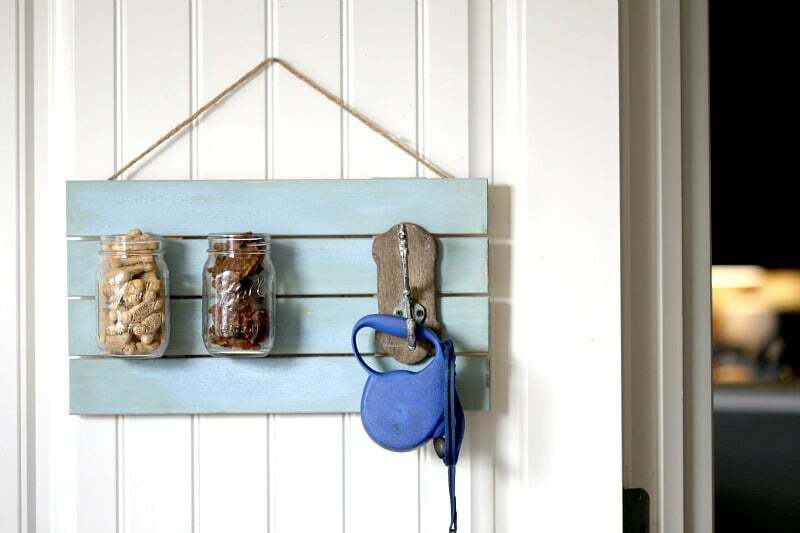 I created this Dog Leash Holder Rack (with Treats too! ), which is perfect to keep your treats on display and ready to “gift” all month long. And this one is classy enough to not only keep on display in your own home, but to gift to a friend or family member that is also a dog lover! This dog leash holder rack project can take several days to completely so make sure you do it ahead of time. 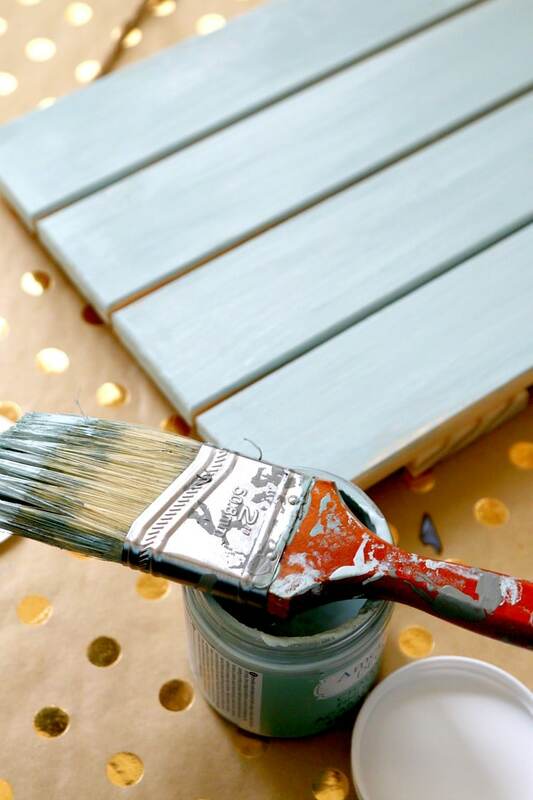 First thing you need to do is paint your pallet or frame. Because I used a crackle paint, I need to follow instructions on my wood by painting, adding crackle paint, and repainting, letting coats dry in between. 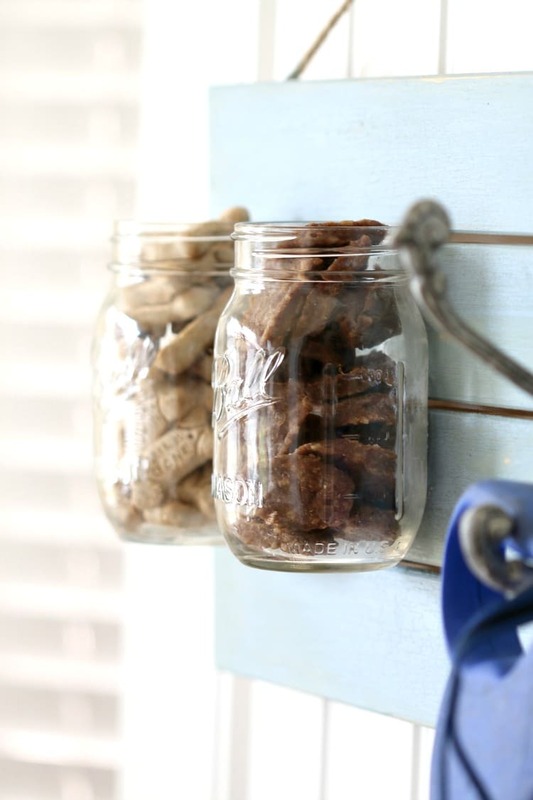 Now you need to attach your mason jars for your dog greats. There are several ways you can do this, but I chose the easiest way. Because the dog treats I was using were not too heavy, I used a gorilla glue that could be used on wood and glass. Your mason jars will need more time than the container says to dry, but mine were attached within 15 minutes of dry time. I let sit for a full 24 hours before filling to be sure. To great a leash holder you can add a drawer knob on the side by simply screwing through your wood. In my case, I found a nice hook and affixed using gorilla glue again. Make sure your items are flush with the wood. Now fill it with treats! 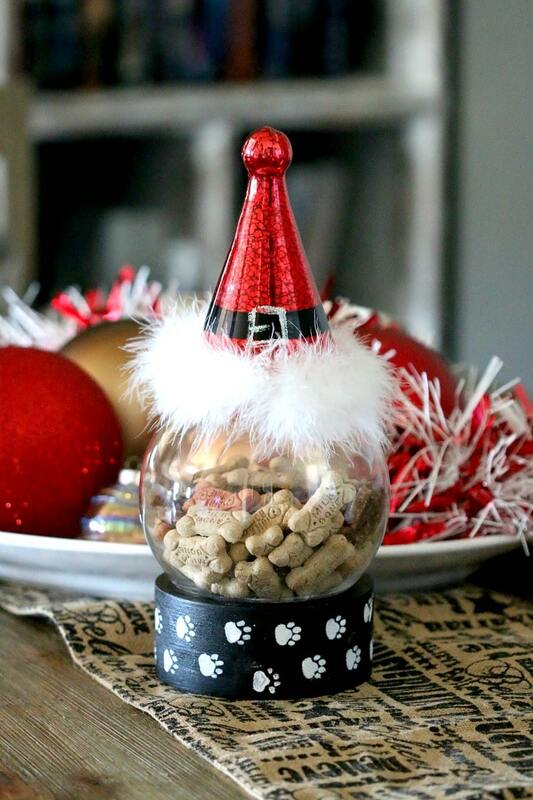 Check out Santa Paws Treat Holder – click image below to see this new DIY!